Clip a rope attachment to the highest level on a cable machine. Kneel on the floor, with the knee of your working side (facing the weight stack) bent to 90 degrees. Grab the rope with an overhand grip with hands shoulder-width apart. Angle shoulders toward the rope with torso facing forward. 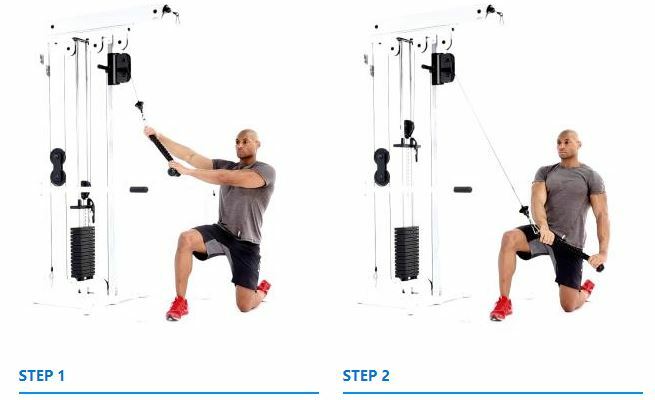 Brace core, squeeze glutes and use your torso to pull the rope down and across your body, past your opposite hip while keeping your arms straight.